I am sitting here in the frozen darkness of this mid-February morning thinking about all of the effort that goes into attracting customers and then ensuring that they get a good customer experience. One’s place of business could be a place where people feel welcome, where the simple act of walking in the door makes people feel better, where every visit is an aesthetic experience. 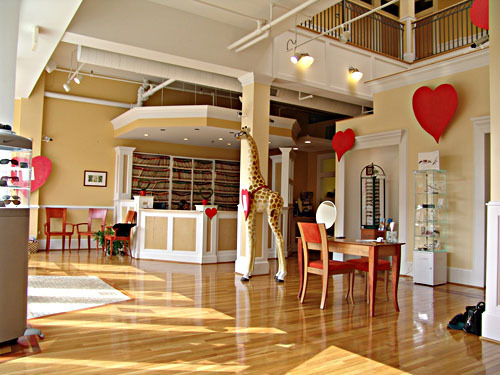 Becky Mann, our Optometrist in Christiansburg, VA, has taken the time to create an outstanding example of a business environment that is sheer joy to visit. 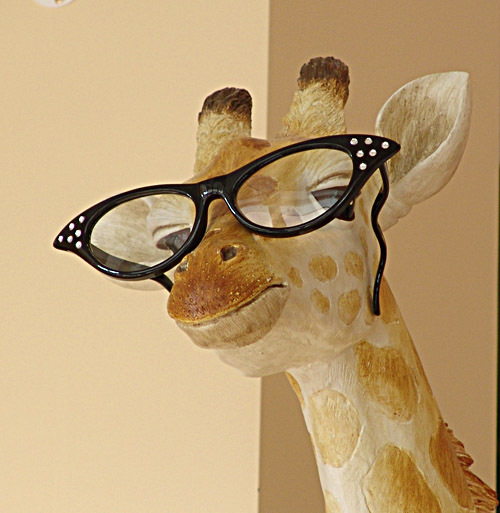 Bright sunlight streams into the spacious lobby area where you are greeted by a ten foot tall giraffe wearing glasses, inviting islands of designer furniture on a gleaming hardwood floor, and by attentive staff whose work area invites you to approach and be greeted. Becky has an exceptional sense of design and has handled every detail so that customers feel included in what is going on and are made to feel welcome and comfortable. The Invision group services are excellent and the scheduling is so good that there is almost no waiting. I am usually in and out of there before I have had a chance to check out all of the tasteful displays of new eyeglass designs. I usually leave with the thought that there is still more to see and enjoy, and looking forward to my next visit. That is an ideal customer experience! Becky Mann has created an environment which covers all of the bases: a pleasing floor plan, efficient and friendly staff, and careful attention to aesthetics, but I think it is possible to achieve a similar result on a more limited budget. 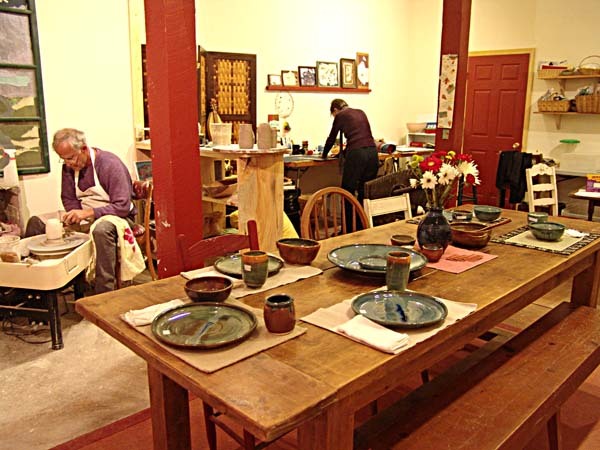 My potter friends at Wildfire Pots in downtown Floyd have consistently created an inviting studio/retail environment that brings people in and makes them feel welcome and they have done it on a shoestring. They almost always have a welcoming table set where visitors can sit and chat while they have a cup of tea and share some of McCabe’s homemade bread. The Jacksonville Center for the Arts in Floyd, Virginia, has also created a welcoming environment and it is being done almost entirely by hospitable staff making visitors feel welcome, because the floor plan and traffic patterns are not conducive to visitor comfort. I am sure you know of other places which offer a similar experience. These are the places that encourage us to come back through the quality of their welcome. This entry was posted in Basic Business Concepts and tagged Becky Mann Optometrist, Floyd VA. Christiansburg VA, Jacksonville Center for the Arts Floyd, Karen Day, McCabe Coolidge potter, Scott Mann Optometrist, Wildfire Pots. Bookmark the permalink. I have yet to see McCabe’s space, which is absolutely awful of me since I think he’s such a cool guy *must remedy that*. However, I completely agree with the assessment of Invision! I miss the days when I went there to have my eyes tended to, if only I could have kept that insurance grrrr – I still recommend them VERY highly when I can, and am definitely glad to see that another person has had such great ‘service.’ Oh, and they’re awesomely funny people as well, which always helps!